When it comes to the Ottawa Senators, there was no shortage of goaltending storylines during their 25-year history. Even recently, we had the amazing story of Andrew “the Hamburglar” Hammond. He rose to greatness and fell to obscurity in less than the span of one full season. Coming into the season, there were doubts that they had a decent backup plan if something happened to Craig Anderson. Well, something happened and Anderson was unable to play several games for the Senators. Thanks to the general manager’s foresight, the Senators had a capable replacement. Mike Condon came in, going through waivers before the Senators acquired him for a fifth round pick. He played superior to the trade price and was a big part of the team’s success. After his journey through four leagues, Condon had a challenging but insightful NHL rookie season. It was nearly a mirror situation with this year’s, as he played more games than he counted on playing. Condon did not expect to play over 30 games, just as he filled in for over 50 the season before. Although his consistency still needs improvement, it is evident that he took the next step in his development this year. His save percentage is .914, a strong improvement over his .903 from last season. Despite his numbers being closer to average, Condon made a number of big saves in key moments. He helped the Senators to a 13-8-4 record during Anderson’s absence, top 10 in wins and kept them strong in the playoff race. His play against Tampa Bay on Tuesday night was indicative of how Condon has helped the team this season. When things seem like they could turn for the worse, he was there to keep things close when he needed to most. 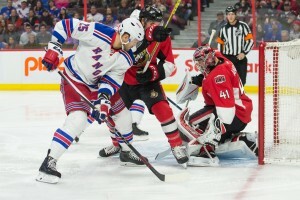 With Anderson out with an injury now, the Senators may need Condon for the playoffs. Anderson has been very impressive despite going through a challenging season. He had gone back and forth between his life on the ice and with his life away from it. The challenges did not deter his play, as he is in a tie for second in save percentage (25 or more games). Arguably, he played even better coming back from his absence with a .941 save percentage in 11 games. He posted a 33-save shutout in his return and capped off a very emotional night. Often underrated, Anderson continues to quietly deliver solid goaltending in a relatively quieter Canadian hockey market. Although the quality of his performances varies by season, he remains a crucial part of the identity of this team. Since joining the Senators in 2011, he has a 147-96-31 record with a .920 save percentage. At the age of 35, a couple of seasons of good hockey remain in him. That gives either Condon or goaltenders in the farm system more time to develop into the team’s next star goalie. Other teams in the league traded away goaltenders in order to make room for one undisputed starter. Tampa sent away Ben Bishop, St. Louis gave up Brian Elliot, and so forth. Jonathan Quick only played seven games for Los Angeles, not enough to be a contributor to his team’s season. Chicago, whom the Senators played on Thursday night, arguably has the best duo. Corey Crawford and Scott Darling have posted top numbers. Washington has a strong case to belong at the top as well, with the team posting the most shutouts so far this season. The Senators are right up there with their goaltenders. They trail only Washington’s 11 team shutouts with nine of their own. Much of the credit belongs to the new coach’s system, but the two goaltenders have played immense roles in the improved team defence. Most comforting for Ottawa is no matter who between Anderson and Condon is in net, they believe they can win every night.